Awesome A-frame home in Angola by the Bay! Exclusive, gated community less than 5 milesfrom beach with bay access, crabbing, walking trails, clubhouse and pool! Relax, recharge, andrelish resort-living! 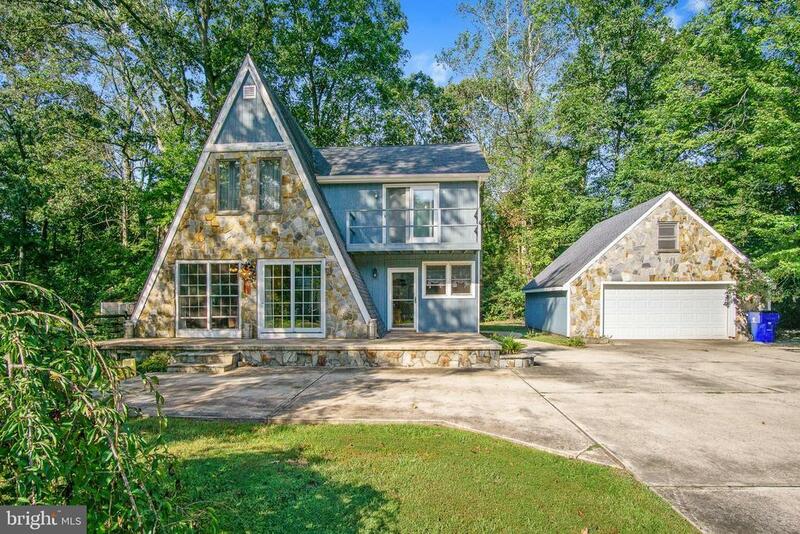 Angles, arches and alcoves make up this impressive stone by-the-beach3BRs/1.5 bath home on oversized wooded lot with exceptional curb appeal. 2-level patiostretches entire front of home edged with stone wall, colorful flowers and 2 sets of stone steps. Asummer of serenity and sun! Front door steps into charming, ceramic-tiled sunken, sun-infuseddining area ? thanks to dual-corner window and glass paned door - that beckons you to sit andsip, coffee or iced tea! Natural wood baseboards and trim around doors and windows, and oakceiling fan exude instant welcome. Coastal blue/white kitchen touts white cabinets trimmed withblue side panels, Amana/Frigidaire white appliances, blue countertops, and 2-tiered island withoption for tuck-in bar stools that is as refreshing as an ocean breeze! Palladian window on laundryroom door is stunning and beyond is W & D, utility sink and side-door access. Sprawling, tancarpeted front main space boasts 2 sets of glass sliders, dual ceiling fans, exposed white beamsand sunshine yellow paint, offering laid-back look. FR/DR blend is bathed in natural light, muchlike the bays rays, and offers space for both rooms furnishings. Hall leads to faux paintedsunrise peach/white hall bath with white cabinet vanity, tub/shower and makeup counter! Dualentrance BR boasts DD mirrored sliding closet doors, exposed white beams, window andwhite/gray ceramic tile floor. Oversized entrance grants access to carpeted retreat room with yetanother DD closet and window. Black wrought iron spiral staircase lends irresistible charm to analready hospitable hangout and winds up to airy softly carpeted loft, ideal for game or rec room, while white railing overlooks FR below. Back BR has DD closet and dual windows and PR withcabinet vanity and built-in shelving is tucked between this BR and MBR. Sweeping MBR boastsboth beauty and beach vibe! Natural wood beadboard adorns walls, brass ceiling fan offersbreeze and his-and-her closets keep peace. Glass sliders lead to fabulous 2nd level deck, grab abook and tune out the world. The outside awaits with detached, 2-car garage with matching stoneexterior, electric and 2nd floor, plus parking for 7-plus-car-driveway! Shaded backyard has brickoven and begs for BBQs! All-around amazing!